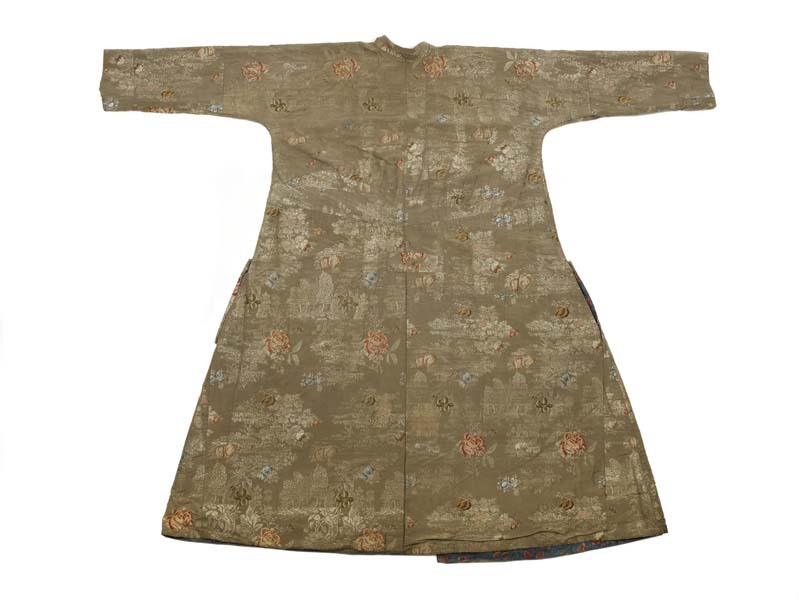 Men's nightgown or banyan made of Spitalfields or English silk dating to the 1730s with a high collar and wide straight sleeves. 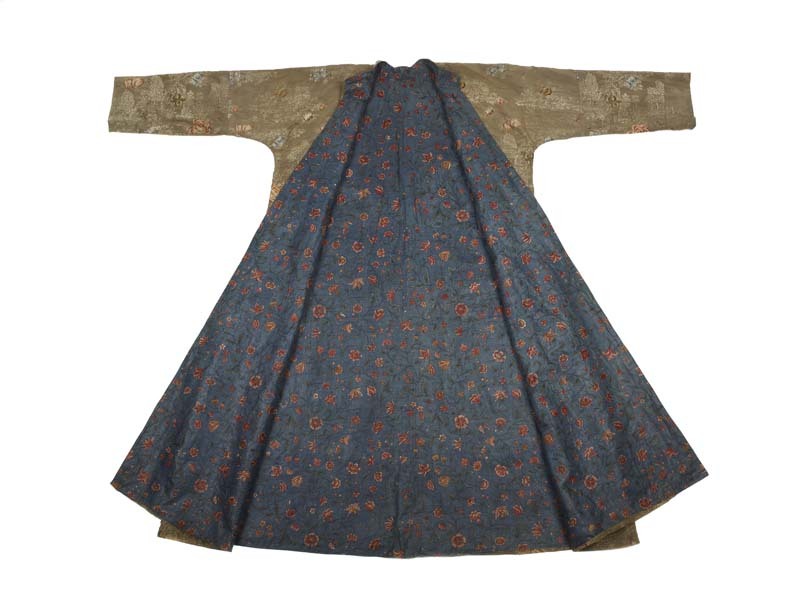 The silk was originally a different garment and has been resewn into the gown probably around the mid-eighteenth century, when the lining was probably added. 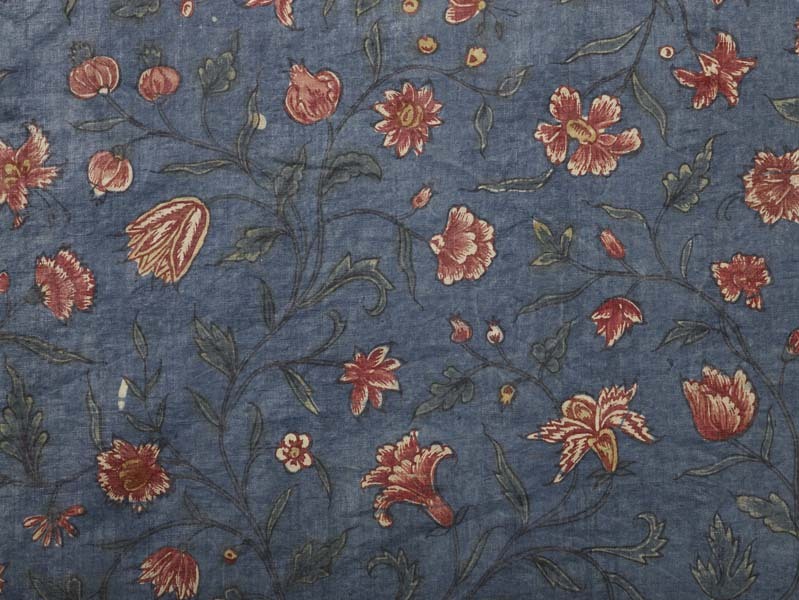 The lining is made of Indian glazed cotton painted with a floral design in excellent condition, dating to the mid-eighteenth century. 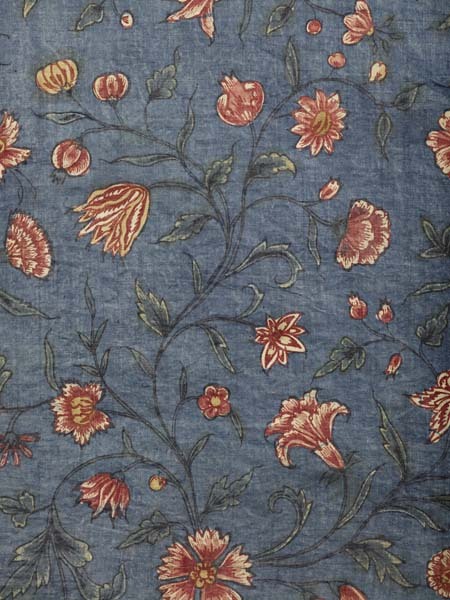 The cotton has an indigo blue ground with floral details reserved and then painted. Most of the making seems to be original and the painted cotton is exceptionally fresh. 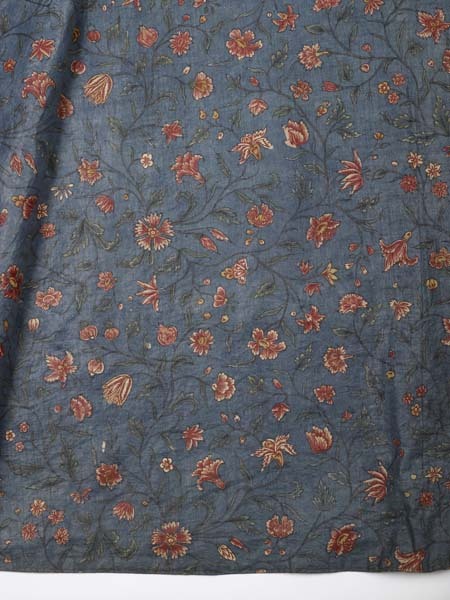 By 1721, the Calico Act had banned the import and wearing of all Eastern cloth to England in an effort to support local manufacturers, including raw silk, muslins, calicoes and chintzes – but it could not be completely enforced. Unless brought back by someone returning from India the painted cotton could not be legally worn either in England or France at the time. 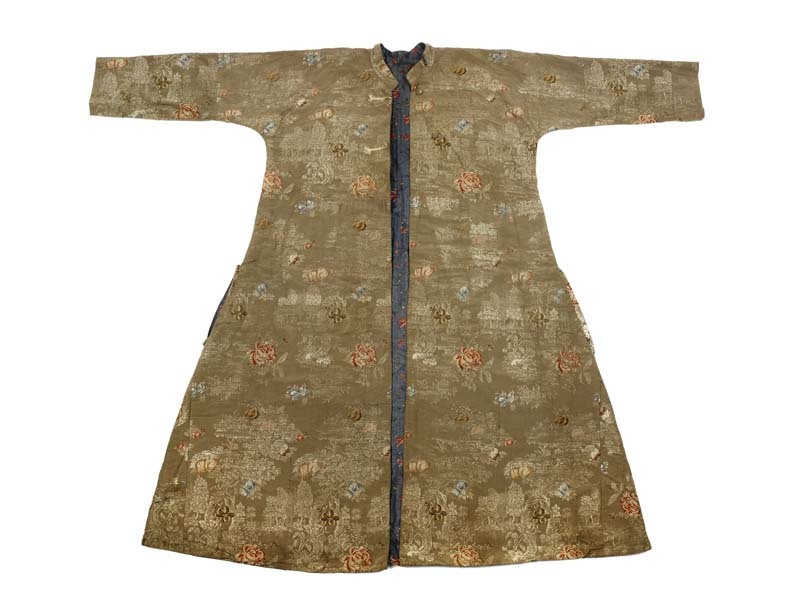 The dressing gown was possibly used for theatrical wear at some point in its history. 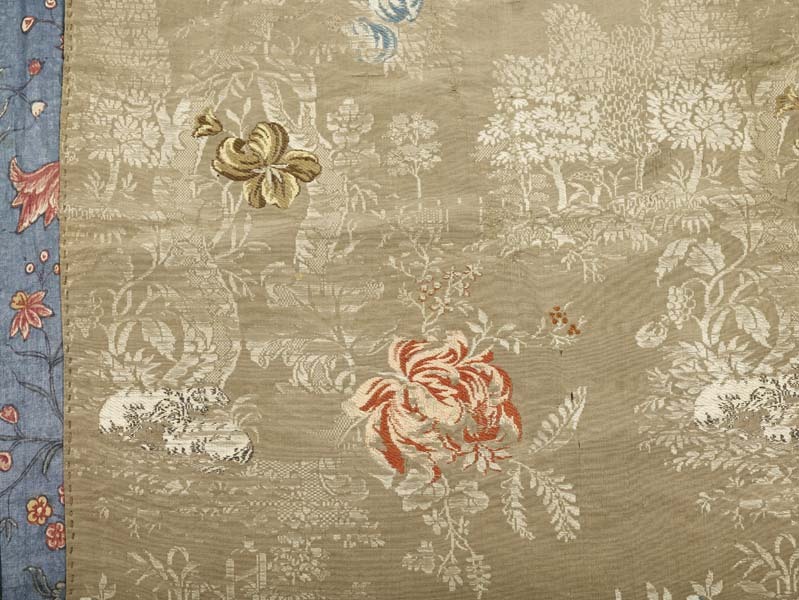 Silk: Buff-coloured tabby with a pattern is of trees in landscapes with disproportionately large flowers. The pattern is made of two suplpementary wefts. One is lance, in white untwisted silk, bound into the ground fabric every 5 warp threads with a single strand increasing 1 weft in a twill pattern. the brocaded broches threads in 15 colours bound into the ground fabric every 4th warp thread with a single stitch increase. Silk fabric width: 510 mm. Repeat: 505 mm; width: 255 mm.